Payroll Manager does not actually store the annual salary of an employee. When you add a new employee you have the opportunity to enter the annual salary if you wish, and Payroll Manager divides this figure by the number of pay periods in the year and populates each pay period with the result. If the annual salary of an employee is changing then you need to enter the new weekly/monthly amounts on the ‘Pay Details‘ screen. In the example below, an employee’s salary is changing to £35,000 per annum from the month of May. To enter this in Payroll Manager you would go to the ‘Pay Details‘ screen and click on the ‘Basic‘ tab. 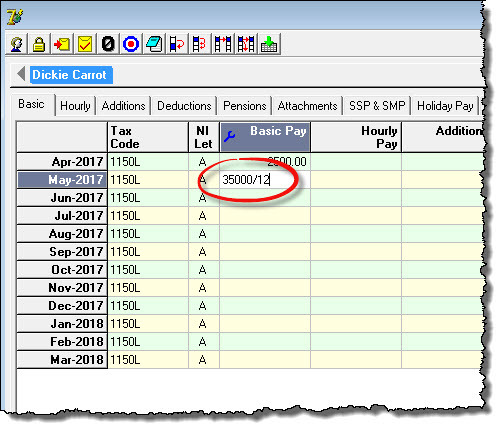 Enter ‘35000/12’ in the ‘Basic Pay’ column for May and press the ‘Enter/Return’ key on the keyboard. Payroll Manager will calculate the new monthly salary as £2916.67 (i.e. 35000/12). 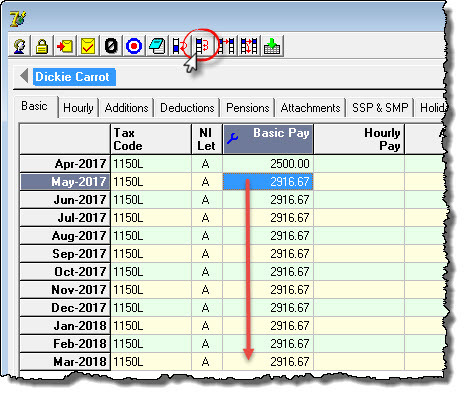 Click on the ‘Copy this cell to all below it (ALT+=)‘ button on the toolbar (or press the ‘ALT‘ and ‘=‘ keys together) to copy this monthly amount to all future pay periods.